To go the extra step with our clients, we always pull them aside on their wedding night in order to get a few more shots. This usually occurs after dinner has been enjoyed, speeches have been said, and the dance has begun. We find that this gives the bride and groom a chance to enjoy a moment alone and away from the chaos; a chance to reflect on the day and breathe, even if it's just for a few minutes. If the night sky is acting in our favour, it will provide us with something beautiful and interesting such as this colourful sunset. 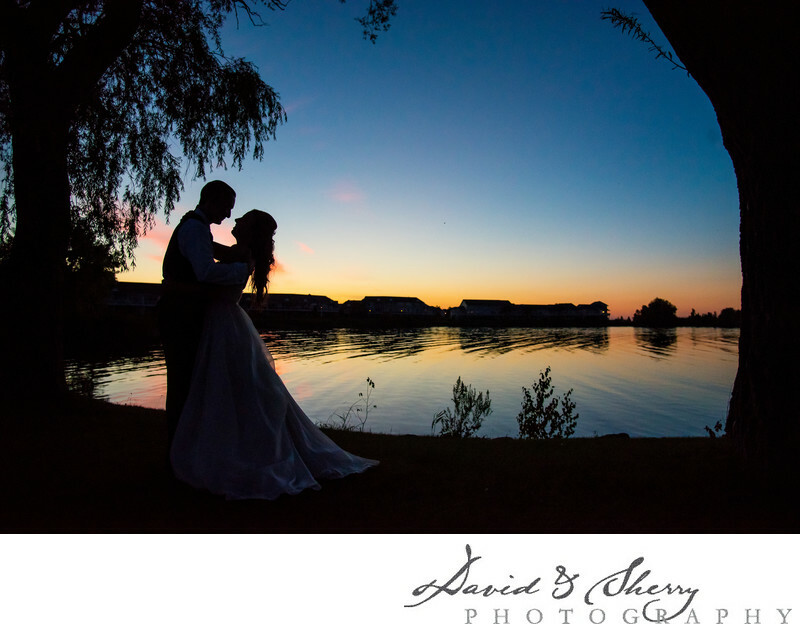 When shooting at dusk or while the sun is going down, a silhouette always makes for a gorgeous wedding photo. This shot of Sam and Becky was taken on a warm July evening at the Cranberry Resort in Collingwood, Ontario. This venue is located right on the beautiful Georgian Bay, and although the sun was setting in the opposite direction, it still created a lovely, soft colour palette in the sky. The willow trees along the edge of the water made a frame around the bride and groom, and the rippled reflection on the lake makes this shot even more stunning. Location: 19 Keith Ave, Collingwood, ON L9Y 4T9.